Ranbir Kapoor does it again. Just when we have gotten over his swoon worthy role in Ae Dil Hai Mushkil, we have gotten our hands on photographs that have left us gasping in shock. That's right! 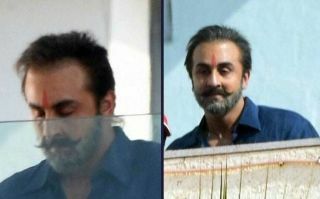 The above pics are of Ranbir Kapoor, who is looking like a doppelgänger for Bollywood's superstar Sanjay Dutt! 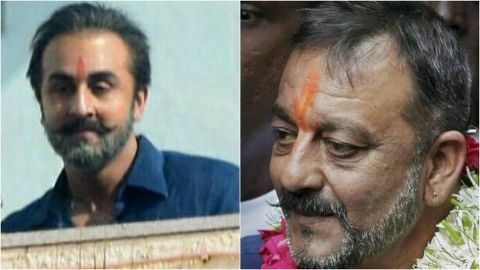 Ranbir is playing Sanjay Dutt in an biopic being directed by Raj Kumar Hirani and produced by Vidhu Vinod Chopra , and this particular scene is from Sanjay's later years.The resemblance is almost uncanny. Ranbir will don a total of six different Sanjay Dutt looks to cover the span of his life, from his formative years, relationship with his father, loss of his mother to many love affairs, controversies and jail sentence. Paresh Rawal is playing the role of Sunil Dutt while Manisha Koirala, Sanjay's co-star in many film, is starring as Nargis, Sanjay's mom. Anushka Sharma, Dia Mirza, Sonam Kapoor and Vicky Kaushal play pivotal roles in the film. We, for one, cannot wait for this movie to come out. Here's more love to both Ranbir and Sanjay.